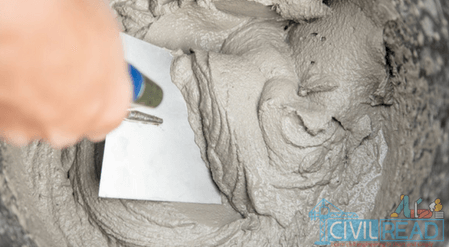 When cement is mixed with water, it hydrates and makes cement paste. This paste can be moulded into any desired shape due to its plasticity. Within this time cement continues with reacting water and slowly cement starts losing its plasticity and set harden. This complete cycle is called Setting time of cement. 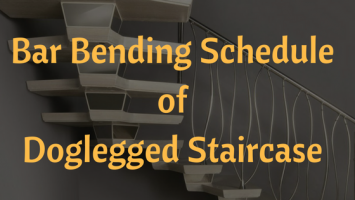 The time at which cement starts hardens and completely loses its plasticity is called Initial setting time of cement. The time available for mixing the cement and placing it in position is an Initial setting time of cement. If delayed further, cement loses its strength. For Ordinary Portland Cement, The initial Setting Time is 30 minutes. The time at which cement completely loses its plasticity and became hard is a final setting time of cement. The time taken by cement to gain its entire strength is a Final setting time of cement. For Ordinary Portland Cement, The Final Setting Time is 600 minutes (10hrs). 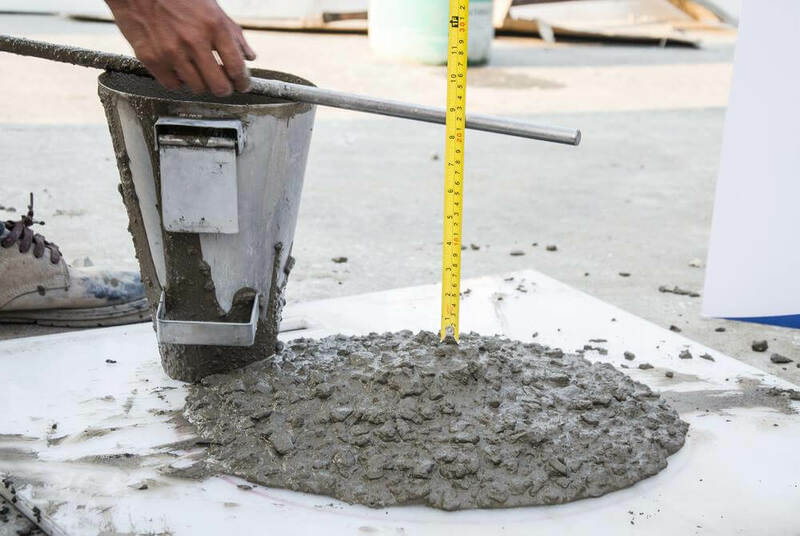 Well, After mixing cement with water, it takes time to place the cement paste in position, initial setting time possess a primary role in strength & it is mandated that cement paste or concrete is placed in position before it crosses initial setting time. i.e.,30mins. And it shouldn’t be disturbed until it completes Final setting time i.e., 600mins for Ordinary Portland Cement. The fineness of cement, the presence of salts in sand, atmospheric conditions. For example, cement requires a temperature of 27°c to complete Hydration, during winters the climate is low which stops the hydration and takes a longer time to set harden. Take 400g of cement and place it in a bowl or tray. Now add water of Start the stopwatch at the moment water is added to the cement. Water of quantity 0.85P.times (Where P is the Standard consistency of cement) is considered. Now fill the mix in Vicat mould. If any excessive paste remained on Vicat mould is taken off by using a trowel. 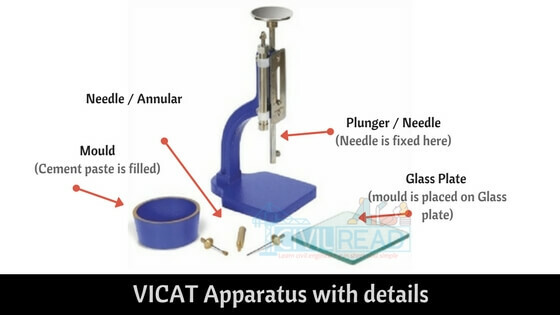 Then, place the VICAT mould on non porous plate (Glass plate) and see that the plunger should touch the surface of VICAT mould gently. Release the Plunger and allow it to sink into the test mould. Note down the penetration of the plunger from the bottom of mould indicated on the scale. Repeat the same experiment at different positions on the mould until the plunger should stop penetrating 5 from the bottom of the mould. The time period elapsed between the moment water is added to the cement and the time, the needle fails to penetrate the mould of 5mm when measured from the bottom of the mould, is the initial setting time of cement. 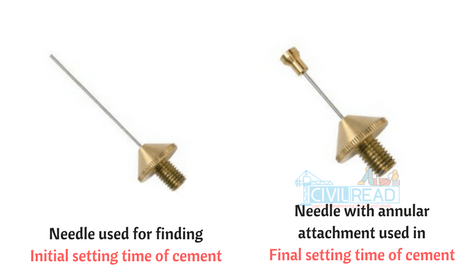 Now replace the needle (plunger) by the one with an annular attachment. The cement is assmed as finally set When, upon applying the needle gently to the surface of the test mould, the needle makes an impression therein, while the attachment fails to do so. 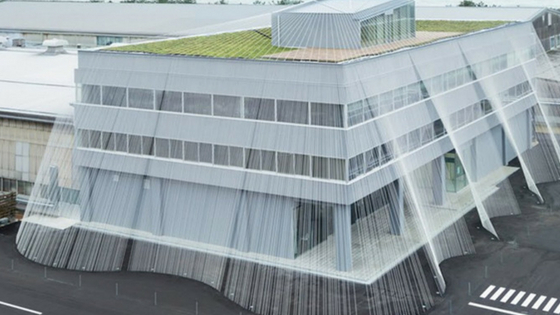 The time period between the moment water is added to the cement and the time at which needle makes an impression on the surface of the mould, while the attachment fails to do so, is the final setting time of cement. How to find quality of sand on site? 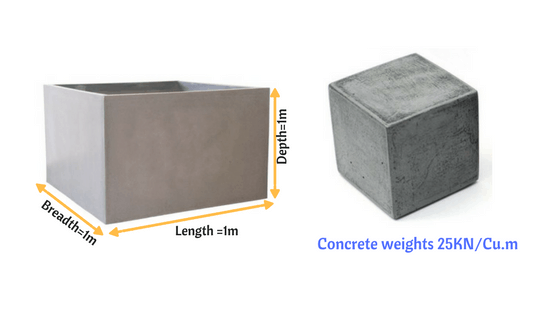 What is the differsmce between ideal cement mix and masonry cement mix.